Although he was made famous by The Montel Williams Show, Emmy award winner Montel Brian Anthony Williams is also an actor, motivational speaker, radio talk show host, author and former navy officer. His television credits include being host of the popular Montel Williams Show, a lead role in CBS’ Educating Matt Waters (1996), and appearances in A Different World (1992), and JAG (1997, 1999). Montel is also a decorated navy intelligence officer. His awards consist of the Armed Forces Expeditionary Medal, two Navy Expeditionary Medals, two Humanitarian Service Medals, a Navy Achievement Medal, two Navy Commendation Medals and two Meritorious Service Medals. Montel was born July 3, 1956, in Baltimore, to parents Herman and Marjorie Williams and has a brother Herman Williams. He attended the Andover High School in Linthicum, Maryland where he was elected president of both his junior and senior classes. Montel was also involved in music and athletics during his school years. In 1980, Montel earned his degree in general engineering (minoring in international security affairs). He became a cryptology officer and served aboard USS Sampson during the U.S. invasion of Grenada for which he won several awards including the Armed Forces Expeditionary Medal, a Navy Achievement Medal, two Navy Commendation Medals and two Meritorious Service Medals. He graduated from the Naval Academy in 1980. After his military life Montel moved into the television industry starting with his own syndicated show The Montel Williams Show in 1991. His themes mostly involved families torn apart by drugs, racism, and the attempt to reunite those families as well as uniting family members who had never met each other. Five years after the show’s debut Montel received a Daytime Emmy Award for Outstanding Talk Show Host. He was again nominated for Outstanding Talk Show Host in 2002, and the Montel Williams Show was nominated for Outstanding Talk Show in 2001 and 2002. After a successful run, The Montel Williams Show was cancelled in May 2008. 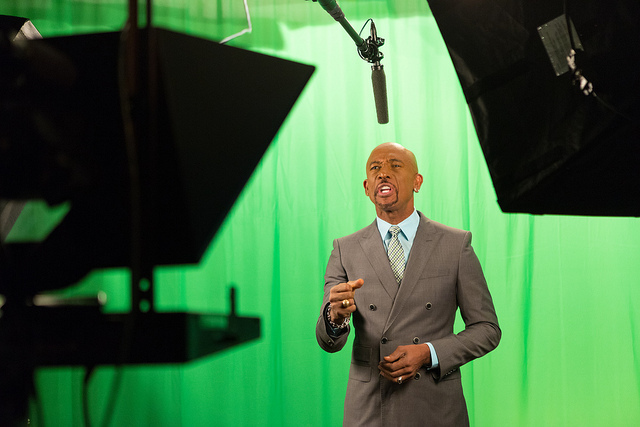 Montel resumed his work in the media in April 2009, as host of the daily radio show, Montel Across America. He has also made several appearances on television including JAG and Educating Matt Waters, a CBS special aired in 1996, and the ABC soap opera All My Children (2002). In 2004 he hosted American Candidate, a political reality show on Showtime. In 1988 Montel was awarded the Special Services Award by the U.S. Chamber of Commerce, joining past winners such as Ronald and Nancy Reagan and George and Barbara Bush. He has also won awards for helping to improve the mental health of children through advocacy and education. Montel has two daughters, Ashley (b. 1984) and Maressa (b. 1988), with his first wife, Rochele See. He married Grace Morley in 1992 and had a son Montel Brian Hank in 1993. His third marriage was to Tara Fowler, on October 6, 2007.